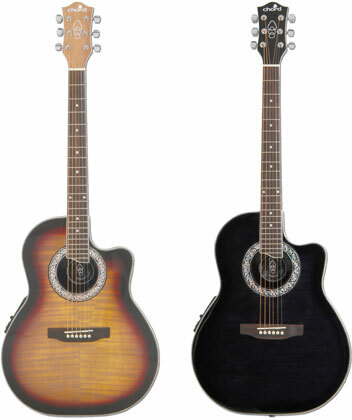 Electro-acoustic guitars with cutaway mini-jumbo body styling and active 4-band EQ system with built-in tuner. Body is entirely crafted from woods native to exotic forest regions of the world. Each has a distinctive grain and figuring which is enhanced by the lustrous clear lacquer. Overall, these are versatile instruments with striking good looks. Cutaway electro-acoustic guitar with composite moulded medium bowl back and laminate spruce top. Finish is a gloss burst over a printed flame-top effect. Neck is mahogany with 22-fret rosewood fingerboard. A 4-band EQ preamp serves the under-saddle pickup with output on a 6.3mm jack at the lower back of the body.